Russian business is child’s play, and very forgiving too, if you are big enough to pay for your mistakes. That’s why Alexei Mordashov is smiling in the picture, taken in Prime Minister Vladimir Putin’s office on December 4. Mordashov is the owner of the second most heavily indebted steelmaking group in Russia, after Roman Abramovich’s Evraz group. Both have made multi-billion dollar blunders buying loss-making US steelmills at premium prices, just before last year’s bust reduced the value of the assets, but left enormous loans to be serviced. 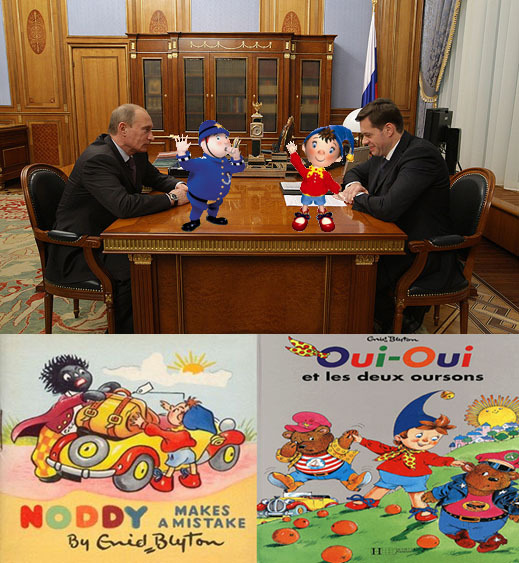 Both have laid off thousands of Russian steelworkers to “optimise” – Noddy’s word – on the costs of producing steel in Russia, so that the Russian mills will make profitable heaps of money, that can be spent subsidizing the blunders across the Atlantic. Mr Plod knows what’s going on – that’s his job. You might think he cares, too. Severstal, the steel and mining group owned by Mordashov, revealed this week that it is trying to sell its American steel service centre group, Northern Steel, for more than $110 million, according to a company leak to Bloomberg in Boston. The negotiations under way are reported to be with “two potential buyers.” The news agency reports the sources as claiming that Severstal initially received five purchase proposals, but has accepted just two for further due diligence. The leak, according to Moscow industry sources, is intended to stimulate a bidding match in a market which has so far proved unwilling to buy any of the assets Mordashov has tried to sell. The steel service centre group on the block came with Severstal’s takeover last year of Esmark’s American mills for $775 million. Northern Steel is reported to have throughput capacity of 1 million tonnes per annum, distributing to 1,500 clients in the US Midwest. In August, Severstal tried but failed to sell its Allenport rolling mill to the North American Trading Company (NATCO). With Wheeling-Pittsburgh, Allenport was another of the ill-fated Esmark acquisitions. “Good” said Mr Plod. “Let’s talk more in detail”. But that’s where the transcript of Noddy’s remarks stops. Industry sources close to Mordashov have told CRU Steel News that the real objective of Mordashov’s meeting with Putin was to obtain permission for a major Russian asset sale, but this may be in Severstal’s mining group, not in the steelmaking group, and not in Severstal North America. There is good reason for suspicion, for Noddy has done this before with Mr Plod. The last meeting between Putin and Mordashov, in May of 2006, the Kremlin’s official excerpts of conversation made it appear the two discussed supply and demand conditions in Russia and the world for large-diameter pipes. At the time, if the transcript is to be believed, Putin set something of a world record for a head of state to know, and care so much about steel pipes. In fact, as became clear in retrospect within days, Mordashov had gone to Putin to ask for his permission to take over Arcelor, the Luxemburg-based European steel giant. Putin agreed. But the tale turned out badly for Mordashov, who was outpointed for brains and outbid for cash by Lakshmi Mittal. 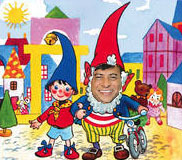 Arcelor now belongs to him, and isn’t anything like the mistake Noddy went on to make with his asset acquisitions in the US.